WARNING FROM SPACE – Astronomers discover an extraterrestrial satellite orbiting in space, pounding Earth’s surface with thousand of meteorites. The meteors turn out to be flying saucers, transporting bizarre alien creatures who carry with them a desperate message for the world’s leaders. 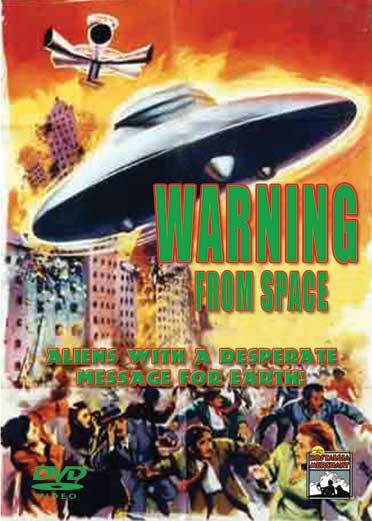 A runaway planet is on a collision course with Earth.Warning From Space, produced by Daiei studios (later creators of the flying turtle Gamera, a popular movie monster in Japan) in 1956, this was the fist color science-fiction film from Japan. Starring: Keizo Kawasaki, Toyomi Karita.1956 – COLOR – 88 Minutes – DVD, Digitally remastered.